Like many of his generation, Bill Bryson backpacked across Europe in the early seventies -- in search of enlightenment, beer, and women. Twenty years later he decided to retrace the journey he undertook in the halcyon days of his youth. The result is Neither Here Nor There, an affectionate and riotously funny pilgrimage from the frozen wastes of Scandinavia to the chaotic tumult of Istanbul, with stops along the way in Europe's most diverting and historic locales. Like many of his generation, Bill Bryson backpacked across Europe in the early seventies--in search of enlightenment, beer, and women. Twenty years later he decided to retrace the journey he undertook in the halcyon days of his youth. 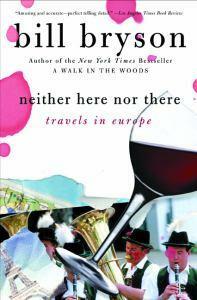 The result is Neither Here Nor There, an affectionate and riotously funny pilgrimage from the frozen wastes of Scandinavia to the chaotic tumult of Istanbul, with stops along the way in Europe's most diverting and historic locales.